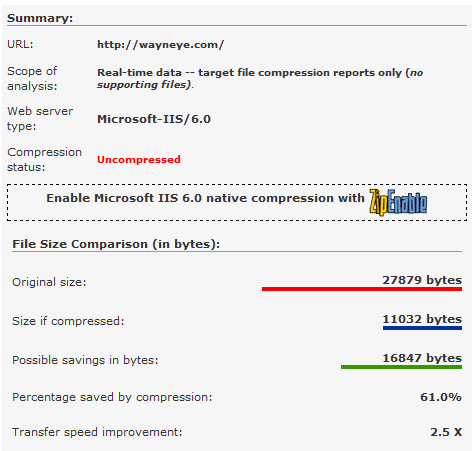 IIS 7 Compression. Good? Bad? How much? 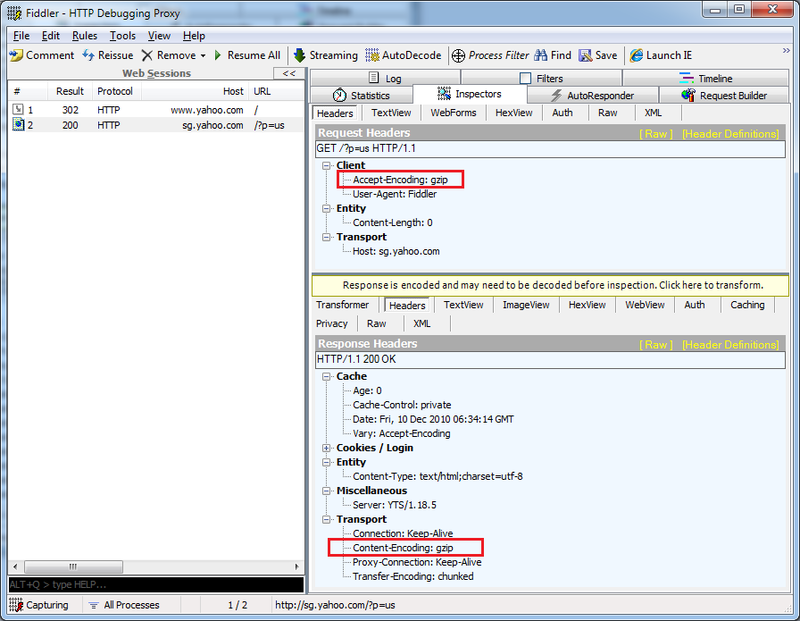 A gzip compressed HTTP package can significantly save bandwidth thus speed up browser rendering after use hitting enter, and user experience got improved finally, nowadays most of the popular browsers such as IE, Firefox, Chrome, Opera support gzip encoded content (please refer: http://en.wikipedia.org/wiki/HTTP_compression). PS: the other compression encoding is deflate, “but it’s less effective and less popular” (refer: http://developer.yahoo.com/performance/rules.html). IIS compress a specific file at first time and only the first time, afterward every time IIS receive request on this file it will return the compressed data. This is usually used on the files not frequently changing such as a static html file, an rarely changed XML, a Word document or any file doesn’t change frequently. IIS will do compression EVERY time a client’s request on one specific file, this usually used on some content that often changes, for example, there is a large CSV file generating engine located on the server back end, and suppose to transfer to the client side, we can use dynamica compress. WOW, I must convince them to enable gzip compression!! 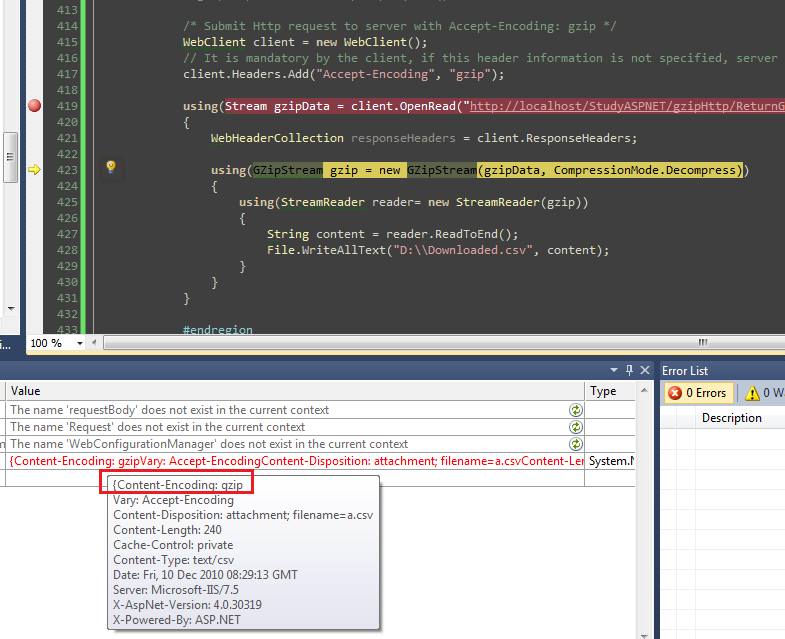 If the request was submitted by a client browser, browser will automatically decompress the Http package, but in the Windows client application or Windows Service, we developers can also adopt gzip compression to save bandwidth, once received gzip Http package from the server, we can programmatically decompressing, I wrote a client console application to submit the Http request and receive/decompress the Http response package. First time, I explicitly set “Accept-Encoding: gzip”, the Http response header contains “Content-Encoding: gzip“, and the depression/file saving operations complete without any issues. 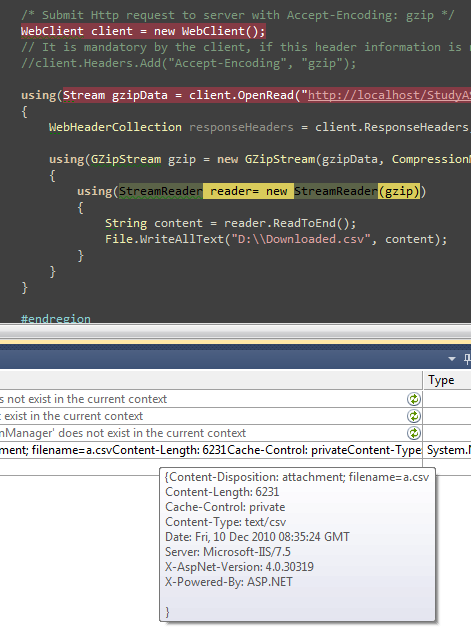 Second time, I commented out the code, the result is, received Http headers does NOT contain content encoding information, since the server deemed you doesn’t accept gzip encoded content, it won’t return you compressed file, instead, it returned the original file, in my case, the csv file itself. Has a significant compress-rate such as Html, XML, CSV, etc. 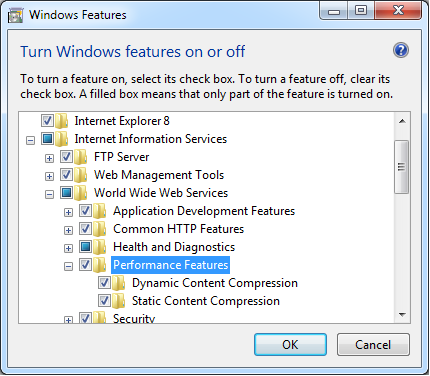 Dynamically generated and the server CPU has availability.